Carry up to 75Kg per bar. 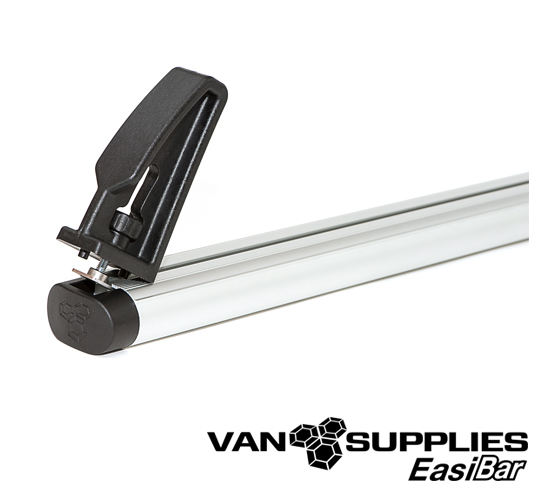 EasiBar is made from anodised aluminium. Features Anti-theft lockable foot covers. UV stable plastic parts resistant to fade. 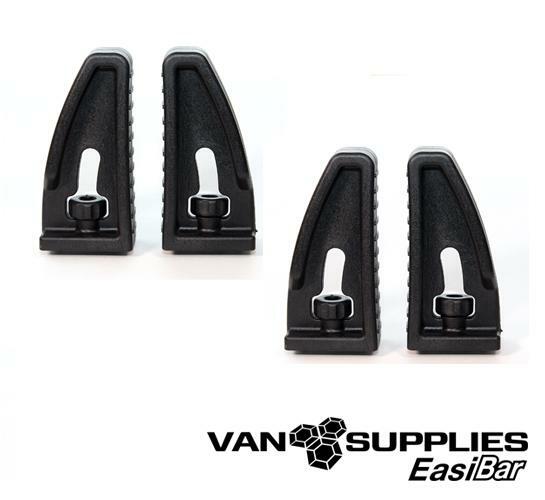 2 Free pairs of quick release load stops included. EasiBars are made from anodised aluminium which is resistant to corrosion. Ribbed roof bars to promote less load slip. Drain feature in the roof bar end cap avoids the T-slot system filling with water. Aerodynamic design eliminates the need for any wind deflectors or whistle strips. Steel, zinc plated & powder coated foot design. 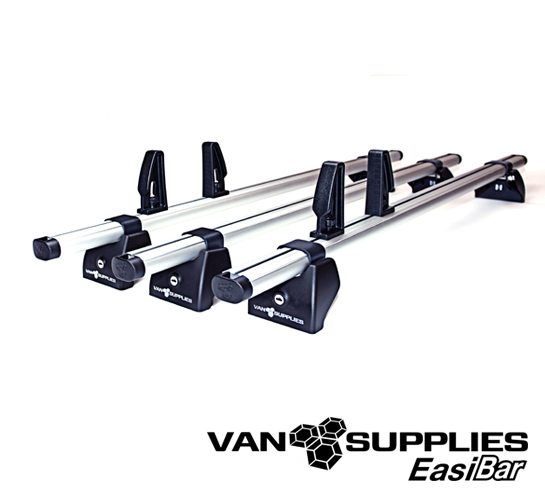 EasiBar profile is compatible with all third party ladder clamps. T-slot system designed for easy fitment of load stops, eye bolts and beacon brackets. 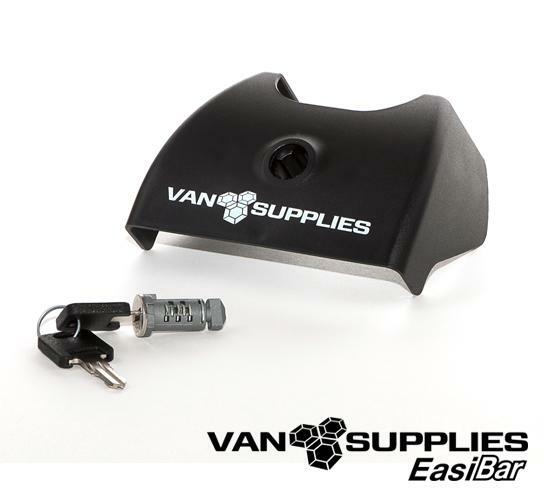 At Van Supplies, we go to great lengths to ensure your shopping experience is as easy and secure as possible. Below are common Frequently Asked Questions. If you have a specific question, feel free to email us at websales@vansupplies.com or call us on 0800 107 0003. We operate a Next Working Day delivery service to the UK Mainland (For Highlands, Islands & Offshore areas please see our Delivery Section for more information). What if I am not at home for delivery? The delivery driver making your delivery will leave a contact card for you to re-arrange delivery for an alternative day. Yes. You will be sent a dispatch confirmation email as soon as your order has been processed. This email will also contain your order tracking number. Why am I being charged for delivery when it states delivery is free? All our delivery charges are pre-set by our courier company. We sell some oversized items which require a specialist courier company to fulfil the delivery, there is an additional charge for these. Our courier company consider some surcharge postcodes as 'Out of area'. There is an additional charge for these also. For a breakdown of where we deliver to including any additional costs please see our Delivery Information section. Can I still get a roof bar set if my vehicle is not an option on your store? We design and manufacture a wide range of products on site, we do not list every single product we manufacture on our website. We are also continually designing and developing new products, so there is a possibility that the product for your vehicle is still being developed. Please Contact Us for more information. How long will a roof bar set last? All of our roof bar and roof rack sets are manufactured using aluminium, steel and glass reinforced plastic parts. All of our roof bar sets are designed, built and tested to withstand the harshest of weather conditions whilst maintaining optimum performance. For added piece of mind we offer a 3-year guarantee on all of our roof equipment parts. Yes, if you Contact Us we can supply the parts you require. Although this could depend on the date of purchase and the type of product you own. Yes, please telephone 0800 107 0003 our customer service team is available to take your order 9am to 5pm Monday to Friday. We currently accept the following credit cards when placing an order through our website or on telephone orders: Mastercard, VISA, Switch/Maestro, Visa Debit, Delta and Electron. We accept all major credit/debit cards, unfortunately we are unable to accept payment by cheque or store cards. How do I apply a promotional code? You can add a valid promotion code in the Basket. We do try to give you as much information as possible on all of our products, however, if you require any additional information then please use the Contact Us form, or call our customer service team on 0800 107 0003 they will try to provide you with all the information you require. If you are unhappy with your purchase you have the right to return it. Please refer to our Returns Policy for information on how to do this. Is it possible to change the address/cancel or amend my order? Due to the volume of orders we receive, we have an automatic invoicing system. For any changes to your order, please call us immediately after placing the order. We can attempt to stop or amend your order with our dispatch team, if it is not possible, we will advise you on the next steps. © Copyright Bri-Stor Systems Limited trading as Van Supplies.